After years dedicated to research, Sarah Trainor is looking forward to working with students at the University of Alaska Fairbanks School of Natural Resources and Extension. She is the school’s new assistant professor of social-ecological systems sustainability. Trainor grew up in Oneonta, New York, and earned a B.A. in philosophy and environmental studies at Mount Holyoke College, a master’s of arts in energy and resources at the University of California, Berkeley and a Ph.D. in energy and resources at UC Berkeley. She and her husband Tom, a chemistry professor, came to UAF 11 years ago, where Trainor was a post-doctoral fellow with Terry Chapin, researching human and fire interactions. “That was a good introduction to social-ecological systems in Alaska,” Trainor said. Her career includes serving as coordinator and director for the Alaska Center for Climate Assessment and Policy, director of the Alaska Fire Science Consortium and stakeholder liaison for Scenarios Network for Alaska and Arctic Planning. Her position with SNRE is partially funded by EPSCoR and Trainor will work with Professor Gary Kofinas for EPSCoR’s northern test case. 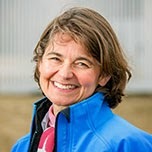 Her research focuses on climate change adaptation, climate change vulnerability and communicating science for decision makers. Although she will maintain her research component, she is excited to work with students. “I’m really happy to be part of the school,” she said. In addition to teaching, she’ll be working with students on several projects. “Students interested in climate change adaptation or related topics should contact me,” she said. Trainor will teach a graduate course, Global to Local Sustainability, fall semester and a new undergraduate class, Introduction to Sustainability Science, spring semester. “I hope the students learn the theoretical structure to frame, understand and analyze complex problems,” she said. “ And I want to give students the practical tools and perspectives to help them grapple with issues and contribute to solving them. Colleague Associate Professor Joshua Greenberg said Trainor brings a wealth of experience and background relevant to natural resources sustainability. “She will strengthen our undergraduate program and support our growing graduate program by raising the profile of sustainability in Alaska and the north," he said. In her free time, Trainor enjoys swimming, biking, hiking, canoeing, kayaking, cooking, cross-country skiing and spending time with her family.